Rakesh Roshan with Hrithik in Mumbai. Hours after Hrithik Roshan shared on social media that his father Rakesh Roshan will undergo a surgery for throat cancer on Tuesday, Prime Minister Narendra Modi retweeted the post shared by the actor and wrote that he is praying for the filmmaker's good health and also called him a "fighter" who will face the challenge with "utmost courage". "Dear Hrithik, praying for the good health of Shri Rakesh Roshan Ji. He is a fighter and I am sure he will face this challenge with utmost courage," PM Modi tweeted. 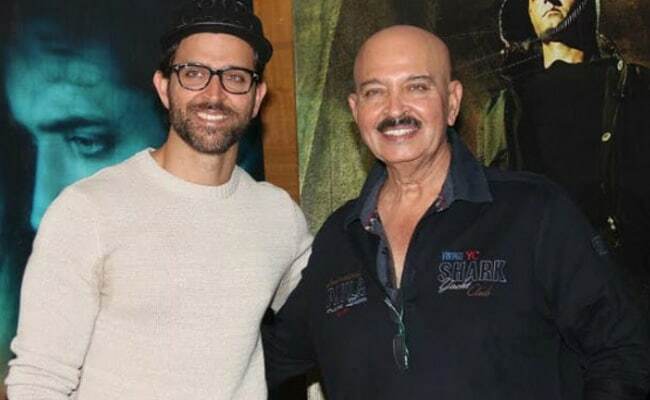 Rakesh Roshan was diagnosed with "squamous cell carcinoma of the throat", Hrithik revealed in a post on Instagram and shared a picture of himself with his father. Replying to PM Modi's tweet, Hrithik Roshan wrote: "Thank you Sir for your concern and good wishes. I am very happy to inform that according to the doctors his surgery has gone off well." "Asked my dad for a picture this morning... Knew he wouldn't miss gym on surgery day. He is probably the strongest man I know. Got diagnosed with early stage squamous cell carcinoma of the throat a few weeks ago but he is in full spirits today as he proceeds to battle it. As a family we are fortunate and blessed to have a leader like him," the 44-year-old actor wrote. Rakesh Roshan, who made his Bollywood debut with 1970's Ghar Ghar Ki Kahani, is best known for his performance in films like Buniyaad, Khoobsurat, Kaamchor and Bhagwan Dada aming others. His first film as a director was 1987's Khudgarz. He also directed some very succesful films like Khoon Bhari Maang, King Uncle, Koyla and Karan Arjun. Rakesh Roshan launched his son Hrithik in blockbuster film Kaho Naa... Pyaar Hai opposite Ameesha Patel. Rakesh Roshan later directed Hrithik in Krrish series, in which he features as the titular character. Rakesh Roshan last produced Kaabil starring Hrithik Roshan, which had a good run at the box office. On the work front, Hrithik Roshan will be next seen in Super 30, based on the like of mathematician Anand Kumar. Rakesh Roshan's First Message After Throat Cancer Surgery: "I'm Alright, God Is Great"